General Plastics Manufacturing Company, a composites industry pioneer and global supplier of rigid and flexible polyurethane foam products, will participate in JEC World 2018, taking place March 6-8 in Paris, France. It will welcome attendees of the leading international composites show to its booth, R45 in Hall 6, within the Washington State Pavilion. General Plastics will highlight product lines and capabilities that help design engineers satisfy demanding performance, process, quality and safety requirements while reducing weight and costs. Visitors will also be among the first to view its new LAST-A-FOAM® RF-2200 Dielectric Foam Series, composite core materials developed specifically for radomes and other radio-frequency applications. JEC 2018 attendees will be able to examine samples of the new LAST-A-FOAM® RF-2200 Dielectric Foam Series, which was designed to provide electrically insulating, RF-transparent protection for antennas, radomes and communications systems. Its high Tg (exceeding 350º) accommodates the thermal curing processes and BMI resins typically used for composite prepregs. Further, the material remains dimensionally stable and are easy to machine, does not absorb water, preserving its dielectric performance even under harsh conditions. Customers may specify densities to satisfy their particular requirements. Standard densities are 3, 4 and 6 pcf. Custom densities are also available. General Plastics’ signature LAST-A-FOAM® rigid foam series for aerospace, transportation, tooling, communications and other composite applications, are renowned for their exceptional uniformity, versatility, durability and strength. Depending on their application specifications, customers benefit from a wide spectrum of products and the technical expertise of General Plastics’ professionals. 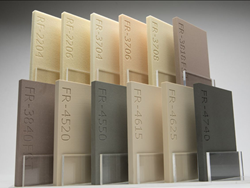 The FST/OSU-compliant FR-3800 FST rigid foam series has demonstrated its value as composite core for commercial aerospace interiors. It is used successfully as a high-performance, low-cost replacement for expensive raw materials, such as honeycomb within nonstructural panels and decorative aluminum parts. Beyond its flammability, safety and strength-to-weight properties, these foams are easy to machine, bond securely with composite skins, and are thermoformable under specific conditions. The FR-3800 FST and the FR-6700 series, which also complies with many aerospace specifications, may be supplied as complex molded or cast parts. The FR-4700 tooling board series is well-suited for high-temperature tooling applications due to its ability to withstand peak temperatures up to 400°F. Other aircraft interior applications include sandwich core for ceiling, wall, door and cabin class divider panels, plus decorative flyaway parts and edge closeouts. Increasingly, customers in other transportation industries are taking advantage of these advanced foam products to conserve weight and costs without sacrificing performance. General Plastics readily scales production from small runs of specialty parts to 100,000 for OEM and Tier 1 and Tier 2 parts programs in its high-capacity Tacoma facility. With the recent purchase of additional thermoforming equipment, the company is producing more complex parts that are ready to install. Its one-stop services extends from part and tool design to 5-axis CNC machining, manufacture of mold tooling, and production of parts through all phases to delivery, regardless of whether they are produced from molded or machined foam. JEC 2018 attendees will have the ability to discuss General Plastics’ parts production capabilities and see how they can streamline their manufacturing processes and meet their schedules while removing excess costs from their supply chain. Tacoma, Washington-based General Plastics Manufacturing Company has been a leading innovator in the plastics industry for more than 75 years. The company develops and manufactures rigid and flexible polyurethane foam products, which include its signature LAST-A-FOAM® brand series and build-to-print composite parts. Directly or through its network of distributors, General Plastics serves the aerospace and defense, nuclear packaging, composite core, prototype and modeling, construction, dimensional signage, testing and marine industries. General Plastics is certified to ISO 9001:2008/AS9100C, Nadcap-accredited (AC7130 Rev. A and AC7130/1 Rev. ), and meets the rigorous demands of numerous leading quality systems, which include NQA-1, Mil-I-45208A and Boeing Company D6-82479. Please visit http://www.generalplastics.com.